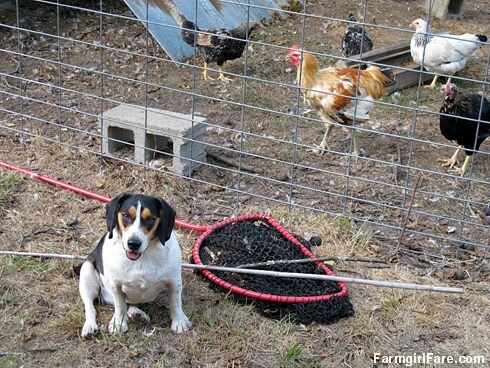 Farmgirl Fare: Sunday Dose of Cute: Beagle Bert, Chicken Catcher? Sunday Dose of Cute: Beagle Bert, Chicken Catcher? Do you see any thumbs on these paws? For 11 years we used an old, short-handled fishing net to catch wayward chickens. It worked great, so when we saw this big, bright, seemingly better version in one of our favorite livestock supply catalogs, we couldn't resist. We splurged. And what did we quickly discover? That it is impossible to sneak up on an unsuspecting chicken while holding an enormous red net. The thing is like six feet long. Trying to use it reminded me of the high dollar, halter-trained llama I bought to guard my newly purchased flock of sheep back in 1995. Oh yes, he was defiinitely halter trained. Every time he saw the halter, he immediately took off running in the other direction. Fortunately we kept the old fishing net—much to the delight of the three little kids who were visiting yesterday. As for Bert, if he wanted to catch a chicken (and he doesn't), I doubt he'd need the net. All the young chickens love him, and he loves to sit in the farmyard and watch his chicken TV. They even let him steal their treats. When he takes a nap in the hay barn, the chickens pile around and for him to wake up. When he wants a little privacy, he retreats to the top of the stack. 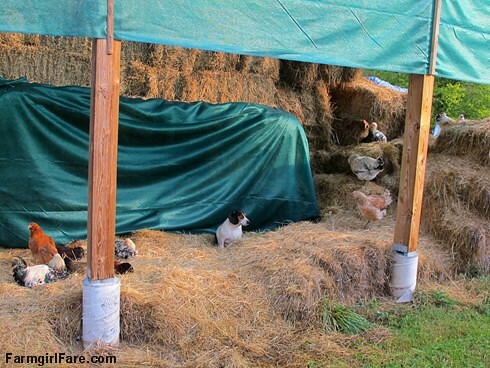 © FarmgirlFare.com, where that green drapery stuff is actually shade cloth, which is helping to keep the sun and rain off of the insanely priced alfalfa hay we broke down and bought last month to feed the sheep and donkeys this winter. (Last week we picked up 800 square feet of rough cut lumber from our Amish neighbor's sawmill—and ordered another 800—to enclose part of the hay barn.) We're still kind of in shock about the expense. We're also hoping to supplement this green gold with some of our own organic grass hay we're going, if the weather cooperates (hooves crossed! ), to cut and bale this week. As for those three kids who visited yesterday, they (not surprisingly) loved Bert too. And after he got over his initial (and understandable) fear of the herd of very loud and very fast moving little people, he seemed to enjoy the attention. It was one of those rare occasions when I didn't have my camera, so I can only tell you about the two little girls who were down on the ground, snuggling and kissing him at once. Too cute. 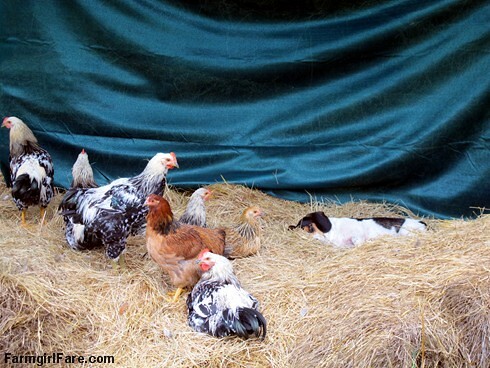 I love the pic of Bert asleep in the hay with the chickens!!!! I hope you send the net back & get a refund. Don't feel bad, we've all been "took" by something or somebody. This was a great post very entertaining, and Mr. Bert is just that kind of Man,Hug & Kissable. We have actually used the fishing net to catch chickens thanks to you mentioning it before, works GREAT!! When I see Bert up in his lookout it reminds me of a childhood book about a little hippo called The Secret Hiding Place. Do you know it? Great story,great illustration. We all need a place of our own and he has his....let's face it, the coolaroo is too popular with Molly to be a "place of his own!" Lovely! Hay certainly is green gold this year. Sorry you had to break down and buy after all the sunny weather. It's been pretty dry up here in Canada too, some hay fields yielded only about a bale an acre after our warm dry August. I'm sure the sheep and donkeys will love the alfalfa. Little girls who love animals steal my heart, too. Fresh eggs have no resemblance to what is sold in cardboard cartons in the local Safeway; I've gotten spoiled. I just found this article tonight, and remembered you bought some alfalfa hay.